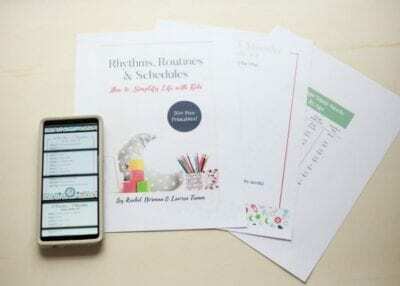 If you’ve got 2 year old sleep regression going on, read this post and get some simple solutions to help you get back to restful naps and evenings. If you previously did sleep training and now it seems to have reverted, keep reading. Post contains affiliate links. You are wondering how you had a baby who was sleep well and then BAM they turned 2 and now they’re singing God Bless America for an hour from their dark room instead of going to bed. Or maybe that’s just us. You might have arrived at the age of 2 and felt you were in the clear, out of the woods having time to breathe… then the 2 year old sleep regression creeps up. Well, the good news is you’re not alone. 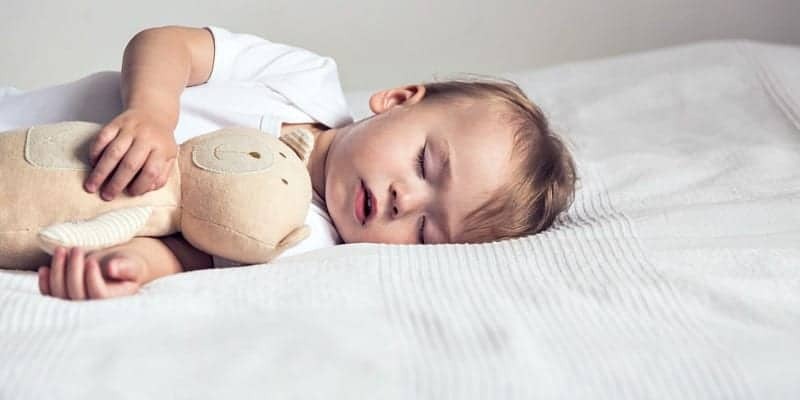 Here are some of the common reasons little ones stop sleeping well at 2 years of age and what you can do about it. I’ve heard time and time again that moms drop their 2 year old’s nap because they start fighting it. This is where we focus on their needs, not their wants. 2 year olds need a nap during the day to get them through until bedtime. The key is to realize your baby has need for a nap and to take your little one to naptime every single day you’re home. If they know it is not a choice, but a requirement, they spend less time fighting it. Choose a logical time (after lunch for example) then create a nice wind down routine and make nap happen. Even if it takes your toddler a little longer to fall asleep, they still need that time of rest. My 3 year old still sleeps in a crib. Because he’s never asked for a bed, he’s still working on his self-control, and most importantly, because there’s no “rule” of when you need to move your little one to a bed. If you have a 2 year old doing these behaviors and nothing seems to work, I recommend bringing the crib back (or borrowing one if you’ve already donated yours) until your child has enough self-control to stay in bed when asked to. If you’ve already moved your child into a toddler bed and they come out multiple times, but you don’t want put the crib back, I recommend getting a gate like the ones below for their door. If you are a deep sleeper and your child won’t stay in their bed then this actually becomes a safety issue. 2 year olds need slightly less sleep than 1 year olds, as a general rule. If your little one is taking long naps they may not be as tired at their normal bedtime. 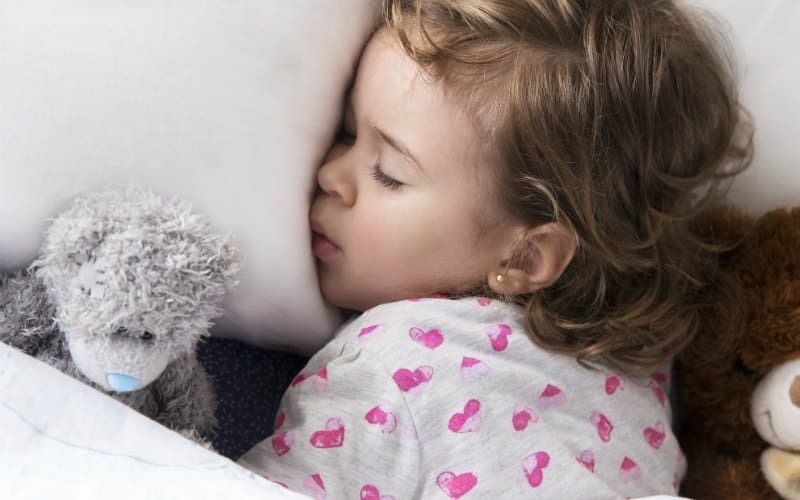 Just because they take a long time to fall asleep at night doesn’t mean you need to put them to bed a lot later, but you may need to tweak naptime. Instead of letting them sleep until 4 p.m., you may wake your toddler up around 3:30 p.m. for example. If they are taking a bit of time in their own bed to fall asleep, but they are happy, then you’re probably fine. They may use that time to play with their stuffed animals, sing, or even talk to themselves. This can actually be a healthy time for them to process what they’ve learned that day. You may adjust their sleep times gradually when you notice they take longer to go to sleep, but don’t make drastic changes. 2 year olds are much more imaginative than little ones. This is both fun for them and slightly scary. You may find your little ones who previously went to sleep in a pitch black room now need a night light. Also, at this age, toddlers can start experiencing separation anxiety. They are more nervous to be separated from you and want a bit more attention in the evening to feel connected and safe as they drift off to sleep. As parents, we need to validate our children’s feelings, not minimize them. You can do this by narrating what’s going on with your child. Phrases like the following do not help alleviate anxiety, so don’t bother with them. There’s nothing to be afraid of. These phrases are the same to a child as the phrase “everything happens for a reason” is to an adult who is going through something crappy. They don’t help and – also likely – they make things worse because our feelings are being invalidated. 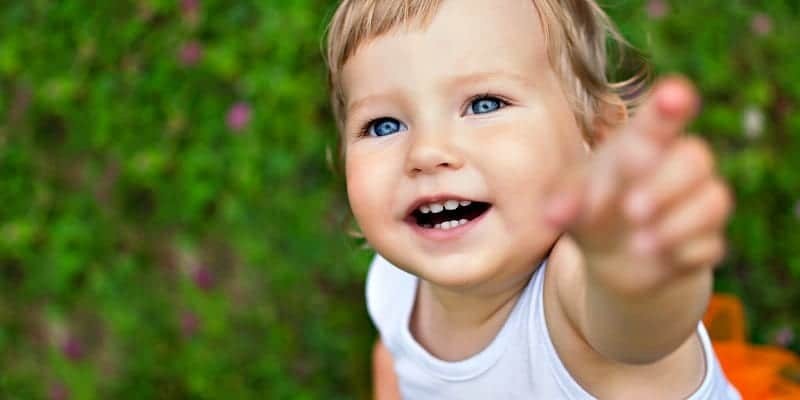 “You feel scared right now, you don’t want mommy to leave.” | This doesn’t mean you won’t eventually go, but you are giving voice to your child’s desire. “You think there’s a monster and you don’t like monsters!” | You don’t need to convince your child there aren’t monsters. It’s like trying to convince someone the earth isn’t flat. They don’t want to listen to reason. The goal is getting a child to believe they are okay. The quickest way to do that is helping them to acknowledge what they’re feeling scared about. Acceptance is more than half the battle. “I love you, you are safe.” | This is powerful to a child since they view you as So Big and themselves as So Small. When your child gets their 2 year molars life gets tough. They are fussy, irritable, and seem like a different child. Teething may last a month or two at this time and it’s important not to drop naps and let bedtime move back later and later as a result. Find a pain management strategy that works for your little one and keep naps and bedtime consistent. If you aren’t sure if they’re teething or not, then give a dose of pain relief (whatever your pediatrician suggests) and see if sleep improves. This is how I’m usually able to rule out – or rule in – teething. If they take ibuprofen and then sleep a full nap for a day or two… I know it’s teething. Give them something to bite or chew on and keep the routine steady. 2 year olds often go through sleep regressions because they are coming into their own minds. They don’t want to miss out. They don’t want to stop playing. They don’t want to be still. They don’t want to rest while other family members keep doing what they were doing. They are starting to assert their wants. Toddler years are great training ground for adults in our mental parenting game. Here’s where we must step back and evaluate our kids’ wants vs. needs. They want to play, but they need to sleep. Don’t bother trying to reason with your little ones because they can’t. Offer as many choices throughout the day that you want, but don’t let nap time be a choice. Your little one is really growing up around this age. A lot of changes are taking place in their bodies and minds. More than likely your toddler is not ready to give up this nap, they just need to work through a few things. Keep your limits and boundaries firm. This regression, too, shall pass. Click here to sign up for my free email series or simply click on the image below. 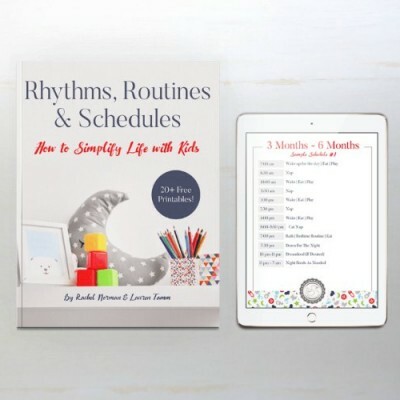 Want your little one to be well-rested, content, and independent? Do you want to feel peaceful, in control, and able to enjoy your days? These routines are tried-and-true, guaranteed to help your little one(s) have more peaceful days. My 2yr old (3 in august) stopped going to bed nicely, stopped sleeping through the night and started waking very early the week before Christmas because she was scared that father Christmas was going to go into her room. Here we are more than 6months later and still no sign of sorting this. There is no option to nap as she is at pre-school all day and we both work. I’m EXHAUSTED. She wakes so often in the night I am shocked she can still keep going! Please do you have any help for us? Thanks, Rachel! I have a question, though. I would have loved to keep my son (turned 2 in July) in a crib, but he kept climbing out and climbing back in in a very unsafe way. We tried the gate, but the way our door frame is, B could get out of the gate. We are forced to just close the door. He actually knows how to open the door and will come out in the hallway at 2:30 am. Both naptimes and bedtimes have been difficult for two weeks now. He used to sleep 13 hours at night and nap for three hours during the day. Siiiiighhhhhhhh. Is there any other advice you can offer? I have two older children and never had these issues. I used one of those kid proof doorknob covers for the inside of my toddlers room when we switched him to a bed. That worked for a long time until he was strong enough and could figure out how to open with the cover on. We are literally in the same boat! As I’m typing at 3am and he’s been up for 2 hours! Hello. My 2 year old is Sedona displays these same emotions you expressed above. We just loved. I thought that was the problem. We set up her room exactly like the old house before she arrived and she never saw the new house in disarray. It’s been a rough two weeks. Thoughts? She won’t fall asleep unless one of us is sitting in the room. She also wakes at night screaming when she notices we are gone. We are exhausted. My husband and I are in the same boat. Everything you have typed is exactly us right now for 2 weeks. Has anything worked lately? My toddler turned 2 at the end of September 2018. For the last 6 days he’s refusing to have his daytime nap. I let him ‘cry it out’ i check on him and also have a monitor. This will last over an hour. At night he will go into his cot with a little fight, but accepts its bedtime. What has made his sleep habits change. He used to wave me out of the room. The last 2 days he’s napped in my room which he is getting used to. I don’t want to start a bad habit of this. Should i be putting him back in his cot and leave him CIO again? He needs his nap as he sleeps from 7pm to 5am. my 2 year old (turned 2 in July 2018) has always been hard to get to sleep and stay asleep. we sleep trained with responsive settling from 4 months old and we managed to get her to the point where she was getting herself to sleep for naps and bedtime well at about 1yr old but she has always woken a lot at night. To the point at 18 months old she was waking every night at around 2am and would be awake for 2-3hours . We saw lots of sleep specialists and paediatricians who organised sleep studues and didnt find a cause and said we were doing all the right things, their last suggestion was to transition from cot to bed and then from the day we did this the issues stopped completely at 2 yrs old, she was sleeping through the night 7.30pm-6.30-7am and was having a nap for around 1hr. Until 3 weeks ago where she has begun refusing to nap most days (shes had one nap in this 3 weeks and this made her take 2 hours to fall asleep at bedtime) even with me consistently putting her down everyday for a nap , i have tried to tweak the nap time to make it later so she’s tireder but doesn’t work. She’s lasting until 7.30pm at night and waking around 7am now. and still sleeping through the night. she gets a little cranky around 6.30pm but thats the only issue behaviour wise. I see you said that 2 yr olds still need naps but is it possible she actually doesn’t anymore. We have a good wind down routine and same thing every day. If we happen to be out she still doesn’t fall asleep in the car in the late afternoon , early evening either. Nice post and good advice. Love to see articles like this. Diana, of course this would irk you if one of the points of advice WILL NOT WORK with yours. That sweet little thing just is an escape artist, isn’t he? Me too. My first two year old actually broke her arm and had to wear a cast for 6 weeks because she jumped out of the crib for her first time. She had never attempted and we didn’t expect it. For my second daughter, we moved her to the toddler bed at two for safety. Alyssa, is it teething? That nearly 2 and 2 year old time is a rough one! My son turned 2 September 16 2018. I’m getting in touch for a client who is interested in acquiring a link on your site. This could be in the form of a new content post or an existing post. In case of a new one, I would provide you with the content, by keeping in mind website and topic relevance, and would strive to meet your content standards. Is this something that you would be able to offer? I am trying to build this client for a long-term, so it would be great to have you on board for some time. Even if you are skeptical about the client, I hope we can get a working relationship going, as I have been working in this stream for years, and have hundreds of such mutually beneficial relationship going on. Kindly keep that under your consideration. Just as all other moms I am going through nap resistance. She usually just stands there screaming MAMA MOM MOMMYYYYYY MAAAA and this can go on for an hour. She is sleepy I can tell and I do know that in her case she just doesn’t want to miss out on playing or going out to the park. I was wondering if me laying down next tk the crib and taking a nap with her would be helpful or make things worse. I would like to show her that I am also napping and she is not missing out on anything since I am with her not somewhere else doing „fun” things (dishes…. ).